C $250 Replaced spark plugs as per scheduled maintenance at 19x,000 km. Car was not misfiring and had no CEL. Took 3 hours of work as 3 out of 6 plugs where deep behind the engine next to the firewall and a lot of parts needed to be removed. US $2000 I live in a more rural area and have a carport rather than a garage. In spite of the fact that I drive the car daily, squirrels or other rodents nested in the car and ate some of the coating on the wires. Apparently Toyota uses a soy type wire coating that rodents love to eat, and it was very expensive to fix and the mechanics couldn't really recommend a surefire way to prevent it from happening again. Although I have enjoyed my Avalon, this one issue alone may well keep me from buying another Toyota when it comes time to replace my vehicle. 31500 mi radio knob fell off. Dealer replaced under warranty. US $1000 Replace water pump. US $200 Had air conditioning system recharged. US $300 I had a belt tensioner replaced and the belt. Had the rotors turned and new brake pads. US $525 Power window switch on the driver side which operated the passenger side window. 9000 mi Replaced driver and passenger visors. 57300 mi Repair the driver's side floor mat anchor. 76000 mi power steering rack and pump leaking. Repair shop wanted $2,000 to replace both items. I added Lucas power steering fluid with stop leak, no further issues or leaks so far. It took a week for the leaks to stop, no leaks since then. 82000 mi Bad shift solenoid. Interlock wouldn't disengage and prevented getting car out of park. US $500 Went to have tires balanced. Tire shop noticed leaking front and rear struts. Replaced all struts and strut mounts. Noticable improvement in car handling and ride quality. US $100 Car failed to start. Replaced battery. US $80 Master cruise control switch (on/off pushbutton)on steering column failed. Power button actually separated out of stalk. US $750 Alternator went bad and was replaced. US $1 Windshield washer resevoir leaking. Found hose had fallen off. Put back on with a hose-clamp and it has worked fine for the past 3 years. US $775 Found torn "rack boot" when inspecting under car to try to assess shudder above 60 MPH. Took to dealer and they fixed boot for about $200. The rest was for new tires and align/balance to fix original shudder problem (basic maintenance). 25000 mi Warning light come on for tire pressure. Tire pressure was OK but light remains on. US $55 Windshield washer hose disconnected Rear window sunscreen extension and retract motor failed. Didn't repair, just pulled fuse. 78000 mi extendable sun shade on rear window failed to operate correctly (previously reported. I had removed the fuse for this circuit. This problem was never corrected. 500 mi Windshield Washer reservoir hose failed. 44000 mi Hose to oil system failed. Lost all oil. Toyota said some Avalons have this issue. yet, no recall or service bulletin. US $200 Power rear sunshade is stuck in the up position. Part needed to be ordered. Toyota agreed to part for the part (unknown cost) I must pay labor $276.25. US $300 Dealer told me that the rack & Pinion steering was leaking and neeeded replacement. I refused.. US $75 Check engine light flashing. Showed 3 cylinders had misfired. Reset codes, replaced gas cap, added Techron fuel cleaner, and started going to Chevron for gas instead of cheapest I can find. This car's at almost 200K so I think I need to baby it a bit with higher quality gas and dropping a bottle of Techron in every 2-3 months. So far no more misfires...fingers crossed. US $150 AC lost all coolant. Dealer said they fixed it, but all coolant has once again leaked out. 77000 mi Coolant leak in evaporator behind the dash. Dealer says repair requires removal of dashboard. It will cost $1600. Delayed repair until springtime. US $120 Flex exhaust pipe was replaced. 315 mi Vehicle shut down completely due to poorly crimped wire bundle leading to computer. Dealer repair went quickly with no further problems next 6000 miles. US $98 Front driver side brake caliper sticking. Toasted rotor before I noticed. US $1350 Check engine light for air/fuel sensors. Could have replaced sensor but due to a defect in the exhaust manifold this issue would not go away completely. Had to replace exhaust manifold and 2 air/fuel sensors. 189000 mi Broken lock on glove compartment...transferred car to my son. US $41 AC evaporator drain was unclogged. US $450 AC condenser replaced. New refrigerant added. US $700 Struts were shot. Replaced with OEM KYB struts. Car is good as new now. Did not need to replace anything other than struts. Springs, boots, isolators were all fine. US $650 Apparently rats got in and ate a bunch of wires resulting in my airbag not working, and my cigarette lighter power ports not working. US $900 x3 Ignition Coils. Something went wrong with the repair and it begins misfiring after long drives (>60mi) Following engine coil replacement the air box broke and needed to be tweaked. But it doesn't seem to have fixed the problem. Car is currently in the shop as of writing this. I'm assuming they will fix it this time. US $200 Stuck front left Caliper. replaced calipers, pads, and rotors on front axle. 128700 mi Engine running rough. Misfire's detected. Replaced #6 ignition coil. 132000 mi Slack in intermediate shaft causing a popping noise and sensation. When advised that it was not dangerous, decided to not have repaired. 139000 mi Intermediate shaft never fixed. Does not pop in summer, only in cold weather. Apparently hot weather causes things to expand and take up wear. US $150 The car threw a CEL so we took it in. One of the coil packs was bad and they replaced it. The car drove pretty much OK before we got it repaired - my wife said she could feel it but I couldn't. US $140 It was just the battery (again). It failed with no warning, but it was in the garage at home so the wife got a day off work (I was already GFTD). This is the second battery in 7 years, but it gets real hot here (Texas) so that's life. 68500 mi The dashboard cover/pad was replaced under warranty. US $2000 Rack started gushing oil, almost literally. It's not reparable so new rack. US $700 Stopped to get gasoline and engine would crank but not start. towed to shop. The starter button or some other circuit element was replaced. Check engine light came on. The dealer said first my gas cap was leaking and replaced it. Later on same day, check engine light came on, on second trip, I was told there was a leak in the gasoline tank and it had to be replaced. Jan 2016 Car battery died so I replaced it with a new one. US $300 replaced CV/axles. Front end alignment. US $367 Replaced #2 & #4 ignition coils. US $579 Sticking calipers caused replacement of calipers, rotors, and pads. 52000 mi Avalon Catastropic oil leak - plastic gasket broke and drained oil. Dealer had car for 1 week and had to dismantle engine, replace broken plastic gasket, oil pan and other major engine parts and then rebuild and flush out engine. 79000 mi Car would not start. Battery ok. Problem seemed to be electrical in starting circuit. Dealer could not duplicate. C $260 One back ignition coil was mis-firing. Replaced other 2 back ignition coils at the same time as a prevention. 84000 mi Clicking in steering when sold. Jan 2012 Low oil. Turned out to be a bad oil plug. Jiffy Lube replaced it and topped off the oil. It was THEIR error, not the car's. The car was sounding louder than usual and the engine light came on. US $180 coil package had to be replaced. 36000 mi hard shifting, hesitation when pressing accelerator until car actually responds. US $200 Rear Center Brake Light. Had to replace entire assembly, which involved removing the rear seat. US $800 Cylinder 1 and 3 coils failed. Replaced all coils and plugs. US $10 Condenser damaged by a stone, lost all oil. US $50 Driver side front wheel bearing was failing. 101000 mi Bad cell in battery; abs waking up overnight and draining battery. Dealer replaced battery, cleaned corrosion at ECM connection. US $50 Leaking power steering hose. The mechanic replaced the clamp. 40000 mi Car hesitated on accelerating repair covered under TSB for emission computer -new program, new sensors 4 hour job. US $300 Dealer quoted nearly $2000 to repair the bar that came out from under the front seat tracks and the rear sunshade which suddenly won't work. I decided to not do it since the agebof the car makes it not worth it. The $300 is for tuneup. US $900 Ignition coils had to be replaced. 65000 mi TSB's dealing with unintended acceleration, and replacing brake cylinder cups/fluid, and oil filter line. 3 separate items, all under the TSB's received from Toyota. 81400 mi driver's side mirror was showing a double image in the reflection of lights, so had it replaced under the warranty program. US $500 Spark coil malfunctioned on one of the back cylinders causing check engine light to come on. Car still ran fine but we towed it just to be safe. Replaced all three rear spark coils because getting to them was difficult and expensive. US $1230 Emission control system problem caused Check Engine & Traction Control lights to come on. Needed to replace one of three catalytic converters and an air/fuel sensor. US $650 Engine warning light on. Replaced ignition coils Moon roof jammed, Replace broken cable drive and mounting bracket. 31800 mi Car was a sun baked Arizona Car. Purchased with issues dealer agreed to repair. - Headliner was falling down in rear. - Front and Read bumper were loose. - Front Radiator Bonnet was missing rivets. 33000 mi Ignition coil on bank 1 bad. Check engine light. Dealer repaired it for free. US $225 Ignition coil #6 went out. All ignition coils were replaced along with spark plugs. 43000 mi Several of the symbols suddenly lit, including the check engine, stability control, traction control and cruise control problem lights. The dealer said it was due to a defective gas cap. US $400 Rechararge of AC system and efforts to identify location of leak. 48800 mi Telescope function via lever. Would spontaneously release. Toyota offered "warranty enhancement" to repair defect (instead of a recall). Car fixed at dealership. US $60 Ignition - One of the spark plug coils died. Diagnosed via OBD reader, replaced coil with new DENSO unit purchased Amazon. Quick & Cheap, but coil should not have died with only 55,000 miles on clock. US $200 Replaced Passenger Side drive axle (CV Joints) as one of the boots got torn, or just gave out. US $28 Gas mileage down 20% or more. The fix was a new MAF (Mass Airflow Sensor). Remove wired connector, remove 2 screws, pull up and remove MAF. Install new on in reverse order. US $90 Replaced original (2005) serpentine belt, also all pulleys, one pulley had worn bearings. Overall I consider this preventive maintenance. US $480 Had to replace something in the wheels and balance tires. US $700 alternator went at 70K miles. replaced with new one. US $602 New rotors and pads on emergency brakes and cleaning rnand rust removal. Plus cleaning. 159000 mi minor oil leak. no repair, would cost $3300. Update September 2018: never fixed. Will give car as-is to granddaughter. US $291 Right cv joint dropping grease on driveway. Replaced CV joint (axle). US $100 Changed out front caliper, rotor and pads. 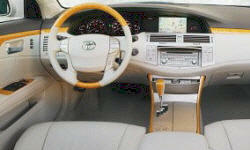 See our lemon odds and nada odds page to see vehicles with no repairs or vehicles with more than three repairs. 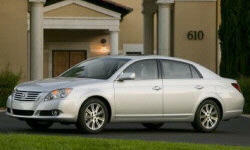 To see how frequently 2010 Toyota Avalon problems occur, check out our car reliability stats.